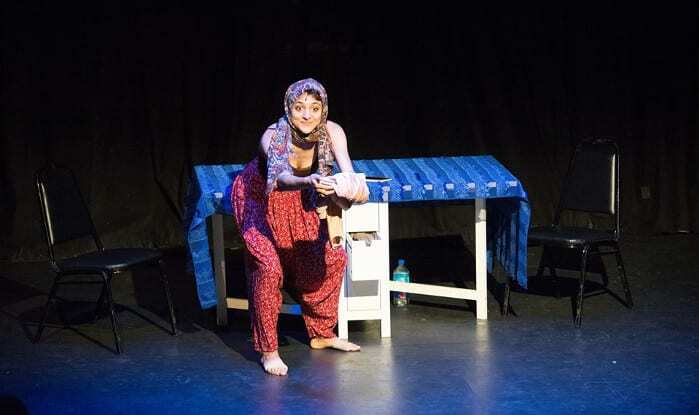 In her unique autobiographical show, Aziz enacted the world she came from and the family she went in search of, all through the use of different characters from her life. Egyptian-American artist Aya Aziz performed her show, “Eh Dah?” Questions for my Father?” at the New York Musical Festival. Her act proved that art could reach people in ways that abstract moral philosophies and political arguments just cannot. Art really has the power to increase empathy. At a time when there is exaggerated fear, hatred, and hostility towards Islam and Muslims, Aziz explored her hyphenated identity—and even celebrated it—in her solo musical. She explored her past and her roots, while dealing with some contemporary conflicts that plague modern American society such as identity, the culture war, and Islamophobia. The dramedy, directed by Corrine Proctor and produced by Arpita Mukherjee (Artistic Director and Co-Founder of Hypokrit Theatre Company) and Shubhra Prakash (co-founder of Hypokrit Theatre Company), may not qualify as your average musical theater world show—but it was well received by the festival goers at the June Havoc Theater this past week. In her unique autobiographical show, Aziz enacted the world she came from and the family she went in search of—all through the use of different characters from her life. The story is about her journey as an Egyptian-American and how she assimilated all the cultural experiences growing up as a “Ghetto-Hippie-Arab-Commie-China Doll.” In 90 minutes, Aziz, raised by an Egyptian immigrant father and an American mother, shares how she was shaped by the eclectic community of New York City but was distanced from her Egyptian identity. As a six-year-old, Aziz went to Cairo with her family, and it was here that her curiosity about her religious heritage and Egyptian roots piqued, much to her father’s dismay. Aziz’s father, a globe-trotting human rights advocate, ensured that she had a life outside the strict religious and cultural expectations of his homeland. At the age of 11, she launched a deeper search for her identity and her faith when she attended Muslim summer camp with her cousins. Aziz was mesmerized by the religion, especially the empowering stories of the Prophet’s enterprising wives. She was intrigued by the people and culture she was alienated from and asked, “Eh dah?” (which means, “what’s this?” in Arabic) every time she encountered new aspects of this fascinating culture. Her inclination towards theater slowly distanced her from her Arab roots as she was exposed to ideas, values and sexual orientation that are sharply at odds with her religious heritage. But her feelings resurfaced by the death of her uncle Abbas, who encouraged her to learn about her Arab roots when she first visited Cairo with her family. The most notable thing about her story is that it reflects the identity conundrum young immigrants face. Her story offers different perspectives on the larger conversation surrounding the current issues of race, religion, and identity in the country which she effortlessly explains through her impressions of her family members. Aziz kept the audience engrossed with her captivating story, which was punctuated only by her equally captivating songs and fusion music played by a three-member band. She moved with ease between characters whether it was her religiously devout and strict aunty Hadia, her patriotic uncle Abbas, or her cousins’ Abdu with swag or Dalia with her slumped shoulders.